so let the wives be to their own husbands in everything. Submission – oh that word! Submission – I don’t know if there is any other word that will cause such a reaction in women, even Christian women! Raised eyebrows, rolling eyes, ruffled feathers, and sometimes even verbal arguments – these are common reactions to that word submission. Why is this so? Surely, a large part of the reason is the fallen human nature of the woman. We can recall that part of the consequences of the woman’s sin was that she would desire to overtake the man, and he would rule over her. Therefore, it is easy to understand these attitudes in the unbelieving woman. It is her natural response. But why is there often objection to submission in many Christian women? It seems that when a woman is redeemed by the Lord and brought back into a relationship with Him, and He begins to restore relationships around her that these objections would change. As the believing woman looks into the Word of God and discovers truth about Christian marriage, it seems that her desire to glorify the Lord would bring her to these very truths. Sadly, the truth about submission is both misunderstood and misapplied, and therefore, dismissed or rejected. However, submission is a supremely important building block for the wise woman as she builds her house. So, let us seek to understand the teaching of Scripture regarding this precious word! First, it is important to understand that submission is one of the most obvious qualities of all Christians – both men and women! All Christians are to submit to God (James 4:7). Servants are to submit to masters (Ephesian 6:5, Colossians 3:22, 1 Peter 2:18). Younger people are to submit to elders (1 Peter 5:5). Citizens are to submit to government (Romans 13:1, 1 Peter 2:13-14). Wives are to submit to their own husbands (Ephesians 5:22-24, Colossians 3:18, 1 Peter 3:1, Titus 2:5). The church (believers) is to submit to Christ (Ephesians 5:24). So, we can easily see that submission is a key mark of the Christian. In truth, submission is the proper response to all authority, for it is God who ordains authority. What exactly does the word submission mean? Submission means: to place in a certain order under another; to arrange in an orderly manner under; to assign or appoint a place under. Take time to look back at the previous list of areas where submission should be evident in the lives of believers. Can you see how this definition would apply? Can you see how the believer would be placing herself and arranging herself under another? Now, let us recall that we previously considered that the wife is to respect her husband. The reason that respect was so important was because of the position that the Lord had given the husband. It is the Lord Who said that the husband is the head of the wife. Remember? Respect is the heart attitude that the wife must see that she has toward her husband. Willing submission is the outflow of that respectful heart, as she arranges herself under her husband’s authority as her God-ordained head. But right at this point is where misunderstanding about submission so often enters. Submission is not a harsh, dictatorial headship mistreating a submissive wife. It is not a master-slave relationship. And it not a constant asking for permission, much as a parent-child relationship would be. The husband-wife relationship is the most unique human relationship on the earth. It is the closest, most intimate relationship that two people can have. It is a one-flesh relationship! The husband and wife are one! God created the woman for the man. He placed her alongside the man to be with him as his companion in life. And He created her to be a help to him. The man would be the head, and she would be by his side as his help. For any person to truly be a good help to another, she must arrange herself under the leadership of the other. She cannot overtake nor go in her own direction, lest she fail in her calling as a help and companion! Submission is a total arrangement of a woman’s life alongside her own husband. Her life is ordered around his, under his headship. Isn’t that exactly the way the church is to order her life around the Lord, under His Headship? It is when a woman walks in this place that she brings much glory to the Lord. What is a wife’s submission? It is the beautiful picture of Christ and the church. It is the wife willingly giving her life to be a companion to her own husband (for it is not good for him to be alone), and humbly serving her Lord as the help He created her to be, by the side of the man to which she was joined in marriage. What is submission? It is a sound building block that the wise woman will securely set in place right next to the building block respect! Why did we entitle this entry: Submission – More Than Permission? When I first came across the truth of headship and submission, I was one of those women who had a misunderstanding of the concept of submission. I totally missed the beauty and magnitude of what God intended! I took the word submission and made a rather legalistic concept out of it. And I tried to appear submissive. I had somewhat of a mental image, almost as if David was seated on a throne. I felt like I had to take everything that I wanted to do and ask permission as to whether I could do that thing or not. I treated his headship very formally and almost like a parent/child relationship, rather than what God intended as a husband/wife relationship. Now, don’t misunderstand, I really didn’t want David “telling me what to do”, but I was “trying” to be obedient to what I thought the Word of God was saying for the wife to do. I also was quite good at convincing him to say yes to my requests, so, essentially, I was doing what I wanted to do. I was just attempting to get him to “rubber stamp” it, so I could say that David said I could do it, and thereby, I was being a submissive wife, right????? No, no, no, I was so wrong. God wanted so much more in our lives. He wanted us to truly live as one flesh, all to His glory! These are some of the things that began to change. David did not like it when I asked him every little thing, and he actually asked me not to do that. Hmmm! How would I know if I didn’t ask? What I discovered was that the Lord didn’t want me to be always asking permission and manipulating to get my way. He wanted me to give my life to David! He wanted me to arrange myself alongside him, and be a companion in life to him, not concerned with me at all! He taught me how to listen to David. I found that husbands have usually commented on things that they like or did not like when a wife does them. If I thought about it, I already knew what he would want me to do, or not do, in almost any given situation. The problem was it usually didn’t line up with what I wanted to do. I was so good at making excuses and going my own way. But what I had to learn was that God created me to be with “my own husband” in this life. He had called me alongside him in the most intimate relationship on earth. I needed to learn to listen, really listen, to him and trust that the Lord would guide his heart. There are countless times that I have witnessed that very thing. There are also times that I thought David was wrong, and later discovered that he had made the right decision. I had to remember that it was Eve who was deceived, and not be so sure that my way was wiser. God had given David to me as my head. I had to trust the Lord Himself, as I arranged myself under David, and that was not always easy. I will share this encouragement. The longer that you walk in a one flesh relationship, as a companion to your husband, arranging yourself under his headship, the easier it becomes. You see the blessings in it. You become aware of the safety in it, and you experience a deeper and deeper marriage relationship. You learn for yourself of God’s goodness – that ALL His ways are good! Allow the Lord to show you ways that He wants to grow you in this truth. Go back and study the definition of submission. Allow the Lord to show you even more of the goodness of His ways. What/who is your life arranged around? Do you have any authority in your life? Do you resist your husband’s authority and leadership? Do you attempt to manipulate him? You may not have a spiritual husband, but you can still submit to his leadership. We will talk about that next time! Don’t allow earthly situations to tell you that God’s truth cannot be true in your life. Submission – it is so much more than permission! In our world today we see so little of true submission. We live in a day and time where the prevailing thought is both individualistic and assertive. We have been steeped in the thought of, “Do your own thing.” The world boldly proclaims, “Look out for number one!” In the “me” society in which we live, we see so many who spend all of their time, energy, and money seeking only after things for themselves, exalting themselves, asserting themselves, and demanding their “rights.” And though we may see the error of their way, we, too, must be very careful that we are not drawn into that worldly thought. Biblical submission stands opposed to all that the world proclaims. Biblical submission understands that it is God who has ordained all authority. For there is no power (authority) but of God. Authority is ordained of God. Therefore, whoever resists authority, resists the ordinance of God (Romans 13:1-2). Biblical submission declares that because the Lord has set in place authority, we must submit ourselves to that authority if we are to be in submission to our Lord. Let us remind ourselves of the meaning of the word submission. Sometimes translated as submit yourselves, sometimes translated as subject yourselves, and sometimes translated as obedience, the Biblical word for submission is hupotasso in the Greek. The literal translation means: to arrange oneself under; to place oneself under in an orderly fashion; to appoint oneself under; to ordain oneself under. The word is from the root word tasso, meaning to appoint; to ordain; to arrange. The prefix hupo has the meaning under, hence the combined meaning of hupotasso is: to arrange under or to appoint under. Now let’s look at the Greek word for resist (antitasso). Interestingly, this word is formed from the same root as hupotasso. But notice carefully the prefix – anti, which means against. Therefore, the meaning of resist is: to arrange oneself against. Can you see the contrast between the two – to arrange under (hupotasso) and to arrange against (antitasso)? Now let’s refer to the Scriptures: For there is no power but of God: the powers that be are ordained of God. 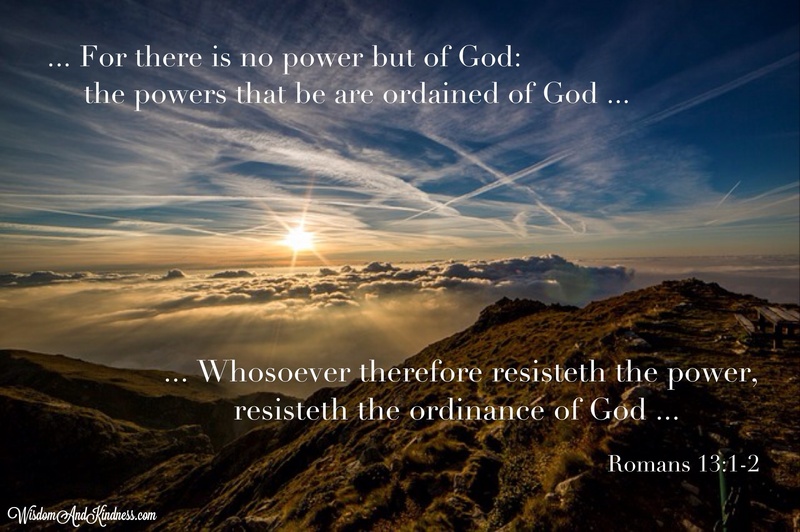 Whosoever therefore resisteth the power, resisteth the ordinance of God (Romans 13:1-2). Now for a final thought – Do not miss the fullness of the truth of the Word of God. If one resists the authority that God has established, she resists the ordinance of God. The word ordinance is diatage in the Greek, and is the noun form of the word diatasso. Did you catch the root of the word? The prefix dia means: through, thoroughly, or completely. This prefix is combined with the root tasso, again meaning to ordain, to arrange, to appoint. God has thoroughly and completely arranged the authority that is to be over each individual. When someone resists that authority, she resists God’s order, God’s arrangement, God’s appointment. If indeed there is no authority but of God, and all authority is ordained of God, when we resist that authority, we resist God Himself. What a hopeless state in which to be! We find this Biblical truth: Yea, all of you be subject (hupotasso) one to another, and be clothed with humility: for God resisteth the proud, and giveth grace to the humble (1 Peter 5:5). Yes, God resisteth (antitasso) the proud. God’s Word says that He arranges Himself against the proud! But how wonderfully we find this truth: He gives grace to the humble. May we not find ourselves resisting the Lord Himself. May we humble ourselves and arrange ourselves under the authority which God has ordained over us, for it is there where we find the preciousness of His grace! Let every soul be subject unto the higher powers … (Romans 13:1). Will you submit or will you resist? Will you arrange yourself under or will you arrange yourself against? Likewise, ye younger, submit yourselves unto the elder … (1 Peter 5:5). Will you submit or will you resist? Will you arrange yourself under or will you arrange yourself against? Servants … be subject to your masters … (1 Peter 2:18). Will you submit or will you resist? Will you arrange yourself under or will you arrange yourself against? Wives, submit yourselves unto your own husbands, as unto the Lord (Ephesians 5:22). Will you submit or will you resist? Will you arrange yourself under or will you arrange yourself against? There are only two responses to the authority that God has ordained. One will either submit or she will resist. She will either arrange herself under that authority or she will arrange herself against God. Lord, help us seek to do those things that are pleasing to You! Authority Speaks – Are You Listenting? Who is the person to whom God has regard? … but to this man will I look, even to him that is poor and of a contrite spirit, and trembleth at My word (Isaiah 66:2). The person to whom God has regard is the one who is humble in heart, who exalts the Lord, and who reverences His Word. All through the Scriptures, wherever we see those considered to be mighty men or women of God, we see humble hearts, we see honoring of the Lord God, and we see such an esteem for His Word that humble obedience to that Word is demonstrated in their lives. True humility produces obedience, and true humility reverences authority. By design, authority speaks. Speaking is the means whereby the one in authority communicates his desires, and thereby his instructions to bring about those desires. This speaking may be in written form or in verbal form, but speaking is always found where authority is found. You may see this practically demonstrated in any area where authority is present. As employees begin a project at work, how will they know that which is expected of them? At some point in time, the boss will speak, directing how he expects that work to be done. Picture a classroom of students. As they enter the classroom and take their seats, what would happen if the authority in that classroom did not speak? It is through speaking that the teacher communicates to those students that which is expected of them. We certainly know of the same truth as evidenced by parents and their children. Authority is meant to speak. And, of course, the highest and ultimate example of this truth is how the Lord God speaks. He is the Creator of Heaven and earth, and as the Ultimate Authority, He speaks. In actuality, He is the only One who has given authority to any other. The question for us should then be: If authority speaks, are we listening? Do we even know how to listen? For the Christian, we must fully realize that the Lord God is the Supreme Authority and He has spoken. He has spoken through His Word. How many times in the Old Testament do we find these words: thus saith the Lord? And the Word of God is clear: God, who at sundry times and in divers manners spake in time past unto the fathers by the prophets, hath in these last days spoken unto us by His Son … (Hebrews 1:1-2). God has, unquestionably, spoken. How, then, can we hear? First, the condition of our heart is of extreme importance. Did you notice in the Isaiah passage that it is a person that is poor and of a contrite heart to whom the Lord looks? And secondly, it is a person that trembles at His Word – one who highly reverences His Word. When, with a humble heart, one listens to the Word of God as the Word of God, intent on doing that which He speaks, then the heart is in the position to hear. How does God speak? You may say that He speaks through Creation. Yes, He does, but the Creation will be a picture and reminder of Who He is and what He has said! The Scripture is replete with examples from the Creation that teach spiritual truths. Consider the fowls of the air … I am the vine, ye are the branches … Behold, a sower went forth to sow seeds … Go to the ant, you sluggard … The grass withereth, and the flower thereof falleth away: but the Word of the Lord endureth forever. The list goes on and on. Certainly God speaks through His Creation. You may say that He speaks through music. Yes, He does speak through songs that are a reminder of the truth of His Word. 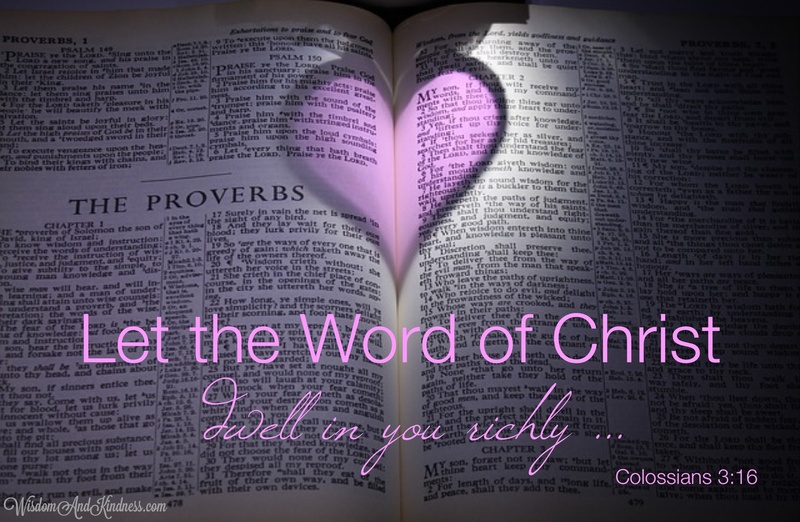 Let the word of Christ dwell in you richly in all wisdom; teaching and admonishing one another in psalms and hymns and spiritual songs, singing with grace in your hearts to the Lord (Colossians 3:16). You may say that He speaks through others. Yes, He does, but it will only be as they encourage, exhort, and speak the truth in love, a reminder of the Word of God (Ephesians 4:15). You may say that He speaks through circumstances. Although this is a phrase that we hear often, we must be very careful. Did you know that the word circumstances is not found in the Scriptures? And, very often, it is when we look at the circumstances that we go astray. Because of circumstances, Abraham went to Egypt. Because of circumstances, Sarah suggested Hagar as the solution for a child. Because of circumstances, Peter denied the Lord. Again, the list goes on. We must always look to the truth of the Word of God, no matter the circumstances. God speaks through His Word. You may say that God speaks through His Spirit. Yes, He does! But never forget that He is called the Spirit of Truth. He always speaks in full agreement with the Father and the Son. He always speaks in agreement with the full counsel of the Word of God. In actuality, He will bring into your remembrance the Word (John 14:26). Yes, authority speaks. God speaks and has spoken. In most cases, as we seek the will of God in a situation, we may find our answer by simply asking: What has God already said? The problem that we face is not that He has not spoken, but that, in most cases, we have not heeded that which He has already spoken. Lord, help us with a humble heart to hear and to heed – to be as those who tremble at Your Word. In a similar way, the Christian wife is to arrange herself under her own husband’s authority. For the husband is the head of the wife – God has designed it and declared it to be so! We, then, as wives, must learn to hear our husbands, and to heed that which they speak. A wife may ignore him, reason against him, argue with him, or defy him. But the truth is that there is a great need to respect him as the authority that God has lovingly given, and with a humble heart, listen carefully that the wife may do that which her own husband speaks. And in many situations, we need to ask: What has he already said? In our Christian lives, when we are hearers only and not doers of the Word of God, we deceive our own selves (James 1:22). Likewise, as Christian wives, we deceive our own selves when we hear only, but do not do as our husbands speak. Jesus said: My sheep hear My voice, and I know them, and they follow Me (John 10:27). A godly wife will hear, and she will follow! Authority speaks – are you listening? Perhaps one of the biggest and most frequent mistakes that wives make in their marriages is looking at their husbands to judge their spirituality. It has proven to be the place of stumbling for many. Although this place of stumbling is not confined to the husband-wife relationship, as it may be observed among many Christian relationships, it occurs so frequently in marriages that, as wives, we must ever guard against this critical error. To understand how to guard against this error, we must first understand its cause. It is very common in Christian circles to find marriages where one spouse is a Christian and the other an unbeliever. Sometimes it is the wife who has been saved and finds herself now married to an unsaved or unspiritual man. However, sometimes the reverse is true. It is the husband who is saved, and he now finds himself married to a wife who is uninterested in spiritual things. It is rare to find both a husband and wife loving the Lord and seeking His will and ways for their lives. For those of you who are in a marriage with a spiritual spouse, it is truly a blessing from the Lord which you should cherish and for which you should be deeply thankful. But what of the Christian wife that feels that her husband is a weight that she seems to drag behind? Perhaps he is an unbeliever. Perhaps he is a believer, but is not a spiritually mature man. This is where the problem arises. The Christian wife often reads much about the Christian life and the Christian family. She listens to sermons and tapes. She attends Bible studies. She has heartfelt desires to bring up her children in the nurture and admonition of the Lord. And as good as those Christian resources may be, the wife often builds within her mind an expectation of what her husband should be. Then, in reality, when she looks at him, she sees that he falls short of this “model man” that she has built within her mind. Additionally, she may look around at other Christian men that she knows. Forgetting that she only knows them from a distance and rarely sees their shortcomings, she compares her husband to those men, and again, the husband comes up way short. How unwise is this trap into which she falls! 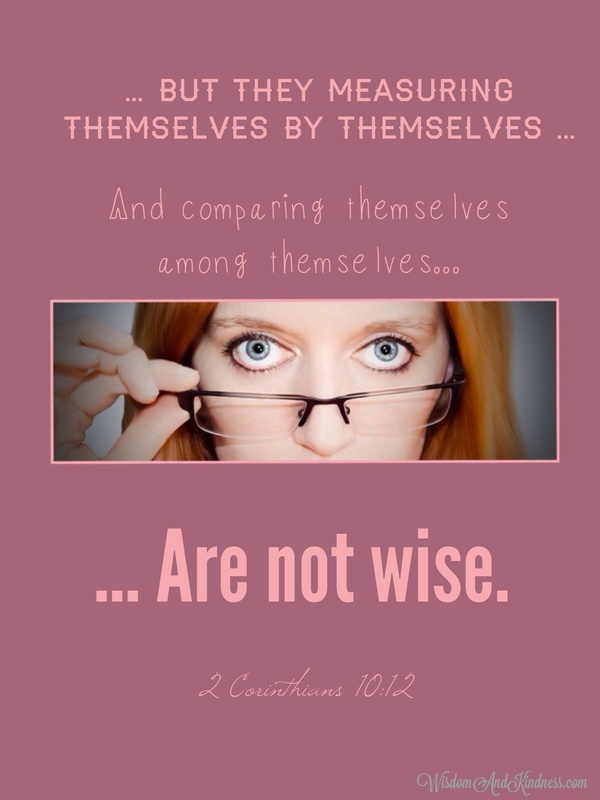 The Apostle Paul spoke of those in Corinth who put together information in a wrong manner and looked upon the outward appearance as those who were not wise: but they measuring themselves by themselves, and comparing themselves among themselves, are not wise (2 Corinthians 10:12). The danger that arises when we measure others by ourselves or by others, or when we compare others to ourselves or to others, is that we can never arrive at God’s view. Most often we will lift our hearts up in pride and criticize the other, or we will see good things in the other and become discouraged with ourselves. With God there is no partiality. All have sinned and fall short of the glory of God. All need His grace and mercy. How important it is that we learn the importance of these truths: Who art thou that judgest another man’s servant? To his own master he standeth or falleth. Yea, he shall be holden up: for God is able to make him stand (Romans 14:4). And: Wherefore receive ye one another, as Christ also received us to the glory of God (Romans 15:7). The Lord does call the spiritual person to seek to restore one overtaken in a fault, but even with that instruction, it is given to the spiritual-minded person. And even then, it is accompanied by an admonition that it be done in meekness and only after considering oneself. For if one thinks himself to be something, when he is nothing, he only deceives himself (Galatians 6:3). How does this all apply to the Christian wife? She is never to hold up her own expectations for her husband. She is never to strive to have him minister in the church according to her desires and her plans. He is the man that the Lord created, both physically and spiritually. Is he is unsaved? Salvation is a work of the Lord. She can never accomplish that work in him. She must wait for the Lord’s timing. If her husband is a Christian, she must still allow the Lord to lead her husband. Often the wife’s voice speaks so loudly and so frequently that because of the noise that she creates, her husband does not hear the Lord’s voice. How we need to be reminded that the husband has a Head. His Head is Christ (1 Corinthians 11:3), and what a perfect Head He is! Whatever the plan is for a husband, only God knows, and only God can accomplish that plan! What, then, is a wife to do if her husband is unsaved or unspiritual? The Word of God answers that question so completely. The wife is to subject herself to her husband, allowing the Lord in her life to shine through. It will not be what she speaks, but it will be the life that she lives that will show forth the Lord. With a meek and quiet spirit that remains calm and sure as she trusts in God, God will often do a mighty work in others (1 Peter 3:1-6). The best encouragement for any wife in this position is to lay down her own expectations for her husband. She must lay down her own plans and desires. She must lay down her own will and ways and focus upon being the wife that God desires her to be, and remember that if someone were to line up her life with a “model woman,” she, too, would fall short. She cannot allow her focus to dwell upon her husband’s shortcomings. She must look for the areas in his life where she can offer up thanksgiving to the Lord. When the complaint arises as to how lacking her husband is in submission to the Lord, always she must ask herself the question of how submissive she is to her husband. Most often when we are finding fault with them we have forgotten our own sin, weaknesses, and faults. We have lifted our own hearts up in pride – and what a great sin that is! Who is an unwise woman? She measures her husband by others and compares her husband with others. This critical error will never give her God’s view. And it will always cause her to lose respect for her husband! May the Lord Himself give us a heart to see as He sees and then to love as He loves! Julia’s Story: Enter the Elk! I love to hear ladies tell their stories as they study Biblical marriage and begin to desire to respect their husbands, and love and submit to them. Each story is as varied as the husband and wife in the marriage. But one thing is sure. Things will begin to change! I recall the young wife who came into a marriage class so excited, as she reported that for years her husband had been asking her to wear her hair down rather than in a pony tail. It was fun just to see her excitement as she had arranged her life under her husband, and the conflict went away. Certainly, submission is not usually so easy as changing a pony tail, but many times it is in the small things where the changes first begin. Those changes are actually occurring in the heart. In instances where there has been resistance for many years, a wife will delight as she submits to her Lord by submitting to her husband, no matter how small the issue may seem. My favorite example of the simplicity of submission came from the young wife whose husband had asked her for years to put the ironing board on her side of the bed rather than on his, but she had persisted in her own way. Again, the simple joy of simple submission as she gave in! But ironing board, move over! I now have another favorite story. This is a simple story of a wife desiring to honor her husband as she arranged her life around his. Here, in her own words, is her story. For years I never would allow mounted animals in my house. I grew up with all kinds of creatures staring at me on the walls: squirrels, deer, and raccoons. If it could be mounted it would go on the walls. I do not know why, but I never wanted that to follow me in my adult life. It was normal, and almost expected, as a child to enter homes in my family and see this sort of trophy on walls, but as an adult I was not “HAVING IT”. My husband, through the years, began to hunt more and more. He killed a deer and had it mounted. I would not hear of that animal hanging in my living room, so he hung it in his closet. That was fine with me. He got to enjoy it, and I did not have to be bothered with it – seemed like a good deal to me. Along the way, he acquired another deer; he hung it in the garage. As years passed, trips got bigger and further away from home. Instead of local hunting camps, now he went to Colorado. It was his 2nd trip to Colorado, and I was really dreading it. He is gone for at least 10 days and with 2 small children at home, it gets rough for me and them. We were sitting at the table the last night before he was to leave, talking about how great it would be if he killed something huge. My 6 year son said, “Daddy, when I kill my 1st deer, I am going to hang it in my closet, too!” UGH, the agony of hearing him say that made me see how wrong I “MAY” have been. My husband teased and said, “Do you see what you have done to our ‘manliness’?” I felt worse. My husband told our son that he was sure if he killed a deer, I would let him hang it over his bed. I told my husband if he killed a ‘huge’ animal, I would let him hang it in our house. I felt safe because he had gone before and not killed anything…. Right??? Well, little did I know what I was saying. The trip came and went, and, yes, he did kill the 2nd to largest ELK in the hunting camp area/region. 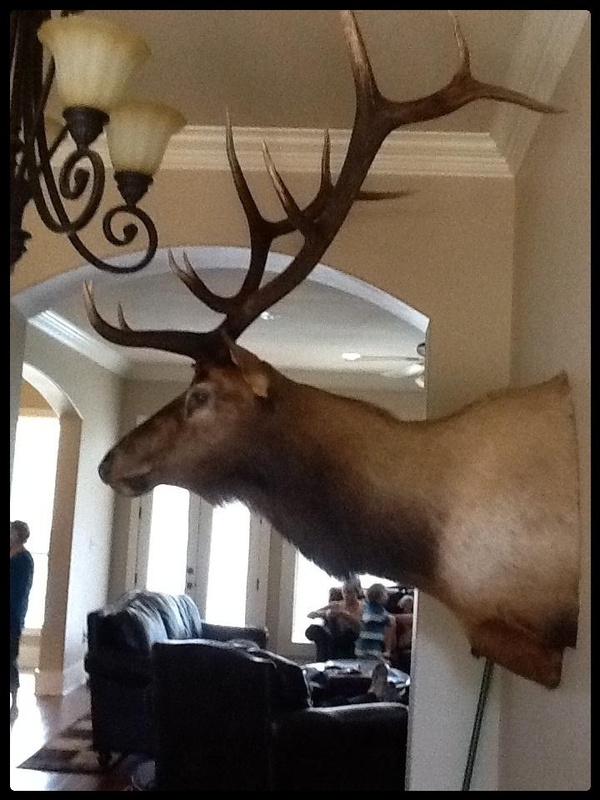 It took a year for the ELK to get mounted and be sent home. The closer it got to that animal coming home, the more I thought I do not know where it is going, but it will not fit in my house. The whole year I said that thing is too large for this house. Let me give you some dimensions. I have 10 foot ceilings. For the mounted animal to fit under my ceilings it has to be mounted 5 foot above the floor, which to me is not appropriate level. It sticks out from the wall 52 inches, so to hang it takes special care. I would not want anyone to round a corner and poke their eye with a horn..
On the night prior to the Elk arrival, my whole house was excited to think the Elk was on the way home. Yes, I was too. My husband had said he would probably take the elk to his boss’s camp in Arkansas… it would fit in perfect there. The camp has cathedral ceilings and rustic décor. I did not want to see him do that but I was not satisfied with hanging it in my house either. Before bed I was reading a Blog on husbands and wives and putting the needs of others before your own. I went to bed praying for my marriage and to have a heart more along the lines of what God would want me to have. When I awoke the next morning, I had a joy and assurance that my husband must bring the ELK home, and I wanted it to stay at home. I wanted it in our foyer and even assured my husband that could be his trophy room. He was so excited and almost giddy. It’s funny how the power of prayer can change a heart. I know it was the power of God because I could not change myself. I now look at that beast of an animal and call it “pretty”. What I had resisted for years, I now welcomed into my home. Surely, it wasn’t for me. But because I wanted to honor my husband in our home, my heart had changed. ENTER THE ELK! What Do You Mean Submit? Have you ever been in a gathering of women when the topic of submission came up? In some women you can almost see the bristles on their neck stand up. Some may flounder around with their comments, but end up concluding, “Surely, God didn’t mean that!” And, of course, you will always hear the age-old “doormat” example brought up as an argument. Sadly, most women respond from their own feelings or from comments of others that they have heard in the past. The responses may vary, but it is certain that few women even understand the Biblical instruction for submission to their own husbands. Fewer still understand the beautiful picture of Christ and the church, a picture that brings much glory to the Lord. As we take up the subject of submission in this meditation, it is our prayer that it will be a truth that you will reflect upon for a lifetime. Before we can even begin a discussion on submission, it is important that we understand the meaning of the word. Sometimes translated as submit yourselves, sometimes translated as subject yourselves, and sometimes translated as obedience, the Biblical word for submission is hupotasso in the Greek. The literal translation means: to arrange oneself under; to place oneself under in an orderly fashion. Now, before we speak directly to wives, let’s address this question: Are wives the only ones instructed to be submissive (hupotasso) in the Bible? If there are others that are instructed to be submissive, who are they, and further still, to whom are they instructed to be submissive? One further question will also need to be contemplated: Why are they instructed to be submissive? As we go to the Scriptures for these answers, may we lay aside preconceived thoughts and ideas, and just search for the truth as the Scriptures state it. In James 4:6, the Scripture says that God resists the proud, but gives grace to the humble. The following verse reads: Submit yourselves (hupotasso) therefore to God. The first truth that we must see is that we are all to submit ourselves to God. Do you know that you will never find submission in a proud heart? It is only the humble that will find the grace needed to submit. And do not miss this important truth – submission is not just for women. It is for all believers – men, women, young, and old. It is the mark of a Christian. We are all to arrange ourselves – to order ourselves – under God. Why is this so? It is so because He is God. He is worthy. He is the ultimate authority over all. However, you will never find unbelievers arranged under the authority of God. They do not acknowledge Him as God, neither do they acknowledge His rightful authority. But in the humble Christian, look closely. There you can view the beauty of gracious submission in action. There you will see a reverence for her God and a loving submission to Him. Now, let’s look at another group of people to whom the Scriptures instruct submission. Servants, workers, or perhaps we could even say, employees, were instructed to submit to their masters (bosses). Exhort servants to be obedient (hupotasso) unto their own masters, and to please them well in all things; not answering again; not purloining, but showing all good fidelity; that they may adorn the doctrine of God our Savior in all things (Titus 2:9-10). Why were these servants to be submissive to their masters? Again, it is because their masters were the rightful authority over them. And by being submissive to them, they reflected the Lord in their lives. The same remains so today. An employee that serves well, without complaint, brings much glory to the Lord. Also, did you know that this is the consistent command given to servants? The Bible never contradicts itself. You will find a truth over and over again, written to different groups of believers, but always the same. To the Colossians Paul wrote: Servants, obey in all things your masters according to the flesh; not with eyeservice, as menpleasers; but in singleness of heart, fearing God (Colossians 3:22). To the Ephesians, Paul wrote: Servants, be obedient to them that are your masters according to the flesh, with fear and trembling, in singleness of your heart, as unto Christ; not with eyeservice, as menpleasers; but as the servants of Christ, doing the will of God from the heart (Ephesians 6:5-6). The message was always the same. They were to be submissive to the authority over them, as servants of Christ. Even in difficult circumstances the Christian is instructed to submission. Hear the admonition given by Peter: Servants, be subject (hupotasso) to your masters with all fear; not only to the good and gentle, but also to the froward (1 Peter 2:18). Now once again, do not lose sight of the truth that submission is not only directed to women. It is for all of those, men and women, who are under someone else’s authority. Why is this so? Once again, it brings honor to the Lord, when someone works humbly and submissively under ordained authority, performed as unto the Lord, as servants of Christ. In a similar way, the Scriptures address the proper response of children to their parents. Children, obey your parents in the Lord: for this is right (Ephesians 6:1). And: Children, obey your parents in all things: for this is well-pleasing unto the Lord (Colossians 3:20). Although the word used is not exactly the same, the same thought prevails. Parents are the ordained authority, therefore, it is proper for children to be obedient to them. Now let’s turn our attention to another authority to whom we are required to submit. Let every soul be subject (hupotasso) unto the higher powers. For there is no power but of God: the powers that be are ordained of God (Romans 13:1). And: Submit yourselves to every ordinance of man for the Lord’s sake: whether it be to the king, as supreme; or unto governors, as unto them that are sent by Him for the punishment of evildoers, and for the praise of them that do well (1 Peter 2:13-­14). Here we see a fuller picture – all authority is ordained of God. When we arrange ourselves under authority, we are being submissive to God. On the other hand, when we rebel against God’s ordained authority, we rebel against God. Although we have addressed relatively few passages, we can see that the subject of submission runs all through the Scriptures. There is no doubt, that God’s people, both men and women, are commanded to be subject to any and all authorities that are over them. And if we really stop and think about it, there would be such confusion without submission. Imagine a world in which no one subjected themselves to God. That is the picture that is portrayed before the Flood (Genesis 6:5-6). What a tragedy! Imagine a job or place of employment where workers refused to be submissive to the bosses. Not only would there be strife and confusion, but it is doubtful that any work would be accomplished. Now imagine a home in which the children refuse to be obedient to the parents. Can you imagine the heartache that those children will bring upon themselves? And what about a nation where each person does what is right in his own eyes, refusing to be subject to laws and governing authorities? What anarchy! We must conclude that submission not only brings glory to our Lord and Savior, but is a necessary ingredient for order! All of this talk of submission, and we have not as yet addressed wives. It is important for a woman to understand that submission is to be evident in the life of every Christian, whether male or female. Every Christian that has ever lived will give an account as to how he responded to the authorities over him. The Word of God is clear – the Christian is to humbly submit to authority, as unto the Lord. Likewise, ye wives, be in subjection (hupotasso) to your own husbands; that, if any obey not the word, they also may without the word be won by the conversation of the wives (1 Peter 3:1). Over and over again, the command is given – a wife is to arrange herself and order herself under one person – her own husband. Any woman that comes to the Scriptures apart from preconceived ideas must honestly agree that the Scripture does require submission of a woman to her own husband. Why is the submission of a wife to her husband resisted so strongly? Often, even the person who would agree that we are to be subject to God, that we are to be subject to governmental authorities, that we are to be subject to employers, that children are to be subject to parents, will flatly deny that wives are to be subject to their husbands. Why is this so? When we return to the Fall of mankind (Genesis 3), a part of the consequences that was decreed toward the woman was: thy desire shall be to thy husband, and he shall rule over thee (Genesis 3:16). The woman would desire to overtake the man, and he would, in turn, rule over her. So in the fallen nature of the woman there is always that desire present to overtake the man. For the unbelieving woman, this remains in her heart, and in a society that cultivates and propagates this thought, that fallen heart only grows in its ways. But what of the Christian woman? God says that He has made her a new creature (2 Corinthians 5:17). Why does she not submit herself to her own husband? First, most Christian women really do not believe what the Scripture says about their husbands. God almost always explains why He gives a command. Listen carefully: Wives, submit yourselves unto your own husbands, as unto the Lord. For the husband is the head of the wife … (Ephesians 5:22-23). Look closely: did you see the reason? Because the husband is the head of the wife. We know little or nothing of headship in our culture, therefore, we simply do not understand what the Word of God is saying. The husband is the head of the wife. The husband is the God-ordained authority over the wife. Until a wife believes and accepts that her husband is given to her by the Lord as her head, she will never successfully arrange herself under his leadership. Each and every day, in prayer before the Lord, a wife must be reminded that her husband is her head and that she is to arrange herself and to orderly place herself under him because the Lord requires this of her. If you still feel yourself resisting, it is probably because you do not realize that you need a head. If God has ordained authority over you, it is for your good, and it is because you truly need it. Think for a moment about children. They do not understand that they need parents. They want to be their own authority. What a disastrous thought! Think for a moment about workers that see no need for a boss or supervisor. What type of work would this produce? And think of all the millions of people that see no need for God as an authority in their lives. They essentially want to be their own gods! Now to be sure, they may not see the need for authority, but the need is there, and the need is real. And for the woman, realize it or not, she needs a head, and the Lord has provided one for her – her own husband! Still doubting? Remember, the Scriptures teach that Adam was not deceived. It was Eve that was deceived (1 Timothy 2:14). Yes, the woman needs a head. But, even apart from this, the Scriptures teach that God actually established this headship before the Fall, by His order of creation. He was establishing that authority when He created Adam first (1 Timothy 2:13). Take time to meditate upon these truths until you see your need for a head. Another reason that a Christian woman may refuse this truth is that she looks at her husband’s faults and weaknesses and determines that God does not intend to use this man as her head. She has forgotten that she, too, has faults and weaknesses, yet God does use her. When a Christian woman lovingly submits to her husband, as her head, it is amazing how the Lord will work in that life! God’s Word is true, and He blesses His Word. And finally, as God directs the woman to be subject to her husband, He paints a beautiful portrait for the world that looks on. Why does this woman behave so? She does it unto her Lord, and in that submission, the Lord is glorified. She shows the humility and submission of her Lord, as he lived and walked upon this earth, being subject to the Father in all things. Additionally, she shows how the church is to be subject to the Lord in all things, giving Him that place of honor which He so rightly deserves! Remember, God always opposes the proud, but how He gives grace to the humble! Lord, help us understand submission. Help us understand that all of Your people are called to submission, sometimes in very difficult circumstances. Help each of us truly receive the truth that our own husband is our head because You have declared it to be so. And help each of us submit from our heart that it may bring much honor and glory to Your name. Amen. Before we address our answer to the question, let’s recall the Creation for just a moment. Day by day, as God created, He viewed His Creation, and in each case, the Scriptures tell us that God saw that it was good (Genesis 1:4, 10, 12, 18, 21, 25). However, as details are given in chapter 2 of the creation of the man and the woman, we find, for the first time in the Scriptures, that God says that something is “not good”: And the Lord God said, It is not good that the man should be alone. Then immediately following that declaration, He announces His solution: I will make him a help meet for him. In contrast to that which was not good, the wife, being a help and companion to the man, was to be a good thing. And, when God finished His Creation, we find this truth: And God saw everything that He had made, and, behold, it was very good (Genesis 1:31). Being a wife according to God’s intent and design truly is a good thing. Listen to the truth of Proverbs 18:22: Whoso findeth a wife findeth a good thing, and obtaineth favor of the Lord. Here we find the same truth again – a wife is to be a good thing. Listen now to the question of Proverbs 31:10-12: Who can find a virtuous woman? And then hear the answer to that question as it relates to her husband: The heart of her husband doth safely trust in her … She will do him good and not evil all the days of her life. So we can see that God not only created and designed the wife to be a “good” thing, but He commends the wife who gives all the days of her life to doing good, and not evil, to her husband. 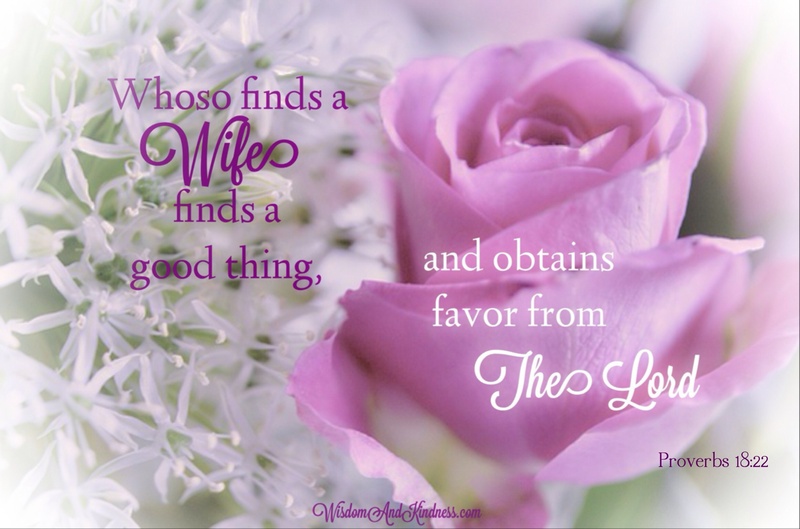 A “good” wife – do you have a heart that desires to be a good wife to your husband? Perhaps you are wondering in what ways you could be a better wife. Well, if God created the marriage, and He did, then let’s look at the three instructions that He gives to wives. We will find that these three truths describe qualities that truly do make a good wife. 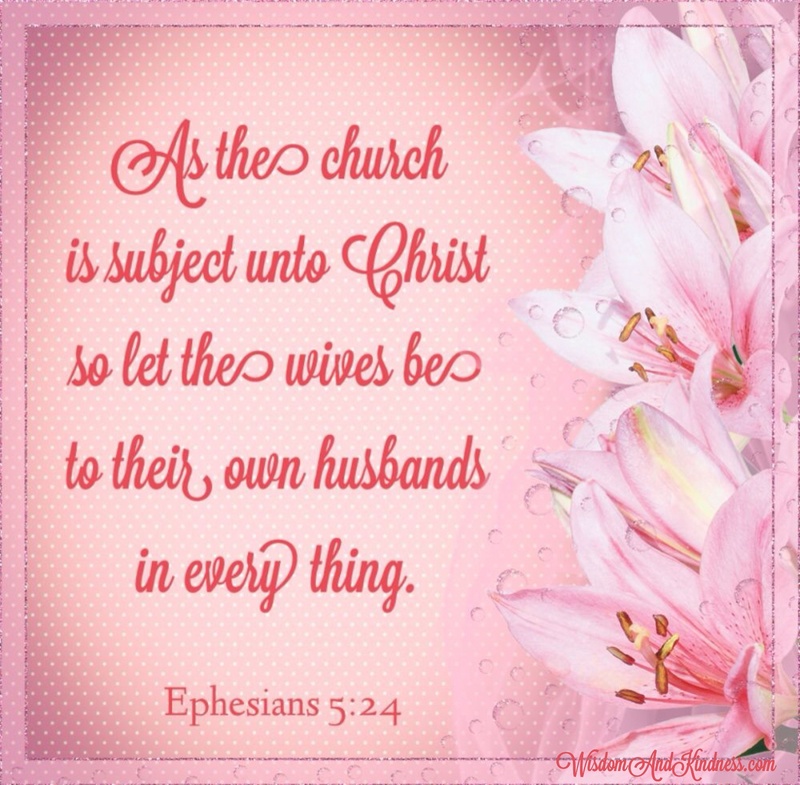 … and the wife see that she reverence her husband (Ephesians 5:33). Reverence – respect! This reverence and respect – or the lack of it – reflects a wife’s heart attitude – how she truly feels about her husband, from the heart. It is from the heart that all of a wife’s words and actions will flow. Respectful words and loving actions come from a respectful heart. Let the wife see to it that she reverence her husband! Also, did you notice that this is a command? God does not make this optional. Neither does He say that a husband must earn the wife’s respect. Actually, the Lord requires this of us. Listen again to the wording: … and the wife see that she reverence her husband. God’s truth is always true. We all have faults and failures. A wife can respect her husband, in spite of his faults and weaknesses. She can respect him just because he is her husband. And, if a wife will make a list of his good qualities, she will be surprised how many ways that she can find to respect him. As her heart toward him becomes more respectful, their marriage will begin to change. See to it that you reverence your husband. The book of Titus instructs the older women to encourage the younger women to love their husbands (Titus 2:3-5). There are misunderstandings as to what love really is. The particular Greek word used in this passage is a friendship, companionship love. It is the kind of love that focuses on the relationship between husband and wife. This kind of love can only be fostered as a wife spends time together with her husband, sharing common interests, walking through life as friends and companions. A wife may feel as though she has nothing in common with her husband. There is a sure way to build common interests. Be interested in what he is interested in! Yes, a wife can be interested in what he is interested in – if she is truly interested in him! She can lay aside her desires, her schedules, etc., and love her husband. She can be a friend and companion to him as she shares his life with him. Through the ability which God supplies, love your husband. It will be a blessing to you both! Wives, submit yourselves unto your own husbands, as unto the Lord (Ephesians 5:22). Did you know that this is the most frequent command in the Bible given to wives? Yes, it really is. No other instruction is given to wives as often as this one. It must be the one that we need to hear the most often – Wives, submit yourselves unto your own husbands. What does submit yourselves actually mean? It means being arranged under the authority of another. This is not the teaching of the twenty-first century, but it is most definitely Biblical teaching. Additionally, it is an outflow of a Spirit-filled life (see Ephesians 5:17-22). Once a wife acknowledge, from her heart, that the husband is the head of the wife (Ephesians 5:23), she will find submission an easier thing. No matter what the world says or how a wife may feel personally, the Word of God is true – even submit yourselves! There is a key to learning to be arranged under a husband’s authority – simply learning to really listen. Husbands say what they like and what they do not like. They say what they would like for the wife to do or not do. It really is that easy – learning to listen and, without arguing, walking in agreement with him. From my experience, I have found that my struggle will always be that I prefer my own way, that I think I know a better way, or that I think I am more spiritual. But not so! The Lord always knows the best way, and He is the most “spiritual” of all – and it is He who says submit yourselves. And, for those wives who have husbands who are not obedient to the Word, the words found in 1 Peter 2:21-3:6 will be an anchor for you! The timeless truth of submission will take the tug-of-war out of a marriage. When a wife ceases from pulling against her husband, the struggle will stop. When, by faith, she arranges herself under her husband’s God-given authority, she will be pleasing to the Lord. What makes a good wife? I guess we really did not need a survey. Respect, companionship, submission – three qualities of a good wife — three truths that will transform a marriage – three truths that bring glory to God.